St Andrew's Holborn traces its history back to the middle-ages and was rebuilt by Christopher Wren following the Great Fire of 1666. It was sited on top of a small hill, above the River Fleet, but when the Holborn Viaduct was built between 1863 and 1869 to allow horse-drawn traffic to avoid the steep slopes that separated the City from the legal quarter, the church lost its prominent position. The existing gardens are now in part owned by the Church of England and in part by the Corporation of the City of London. Our first design (pictured) re-orientated the main entrance of the church away from the Holborn Viaduct, removing the inaccessible 19th century staircase from the viaduct and turning the West doorway into a new accessible main entrance. We unified the two separately owned garden spaces with sweeping curves that attempted to echo the contours of the historic setting, and at the heart of the scheme a new pavilion straddled the boundary between the two properties. 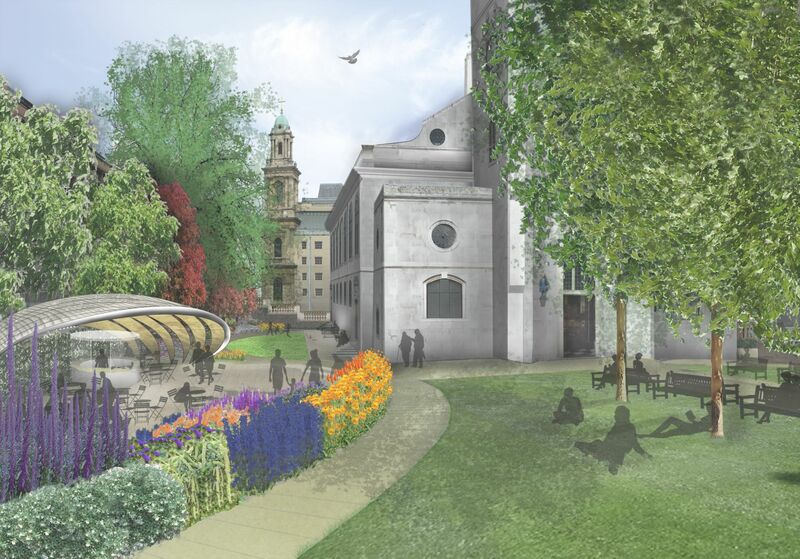 The pavilion was designed to provide respite from the bustle of the city and provide views towards a terrace of vibrant planting and Christopher Wren’s largest parish church. Our design was also closely coordinated with the complete redesign of the Holborn Circus road junction to make a safer environment for pedestrians and cyclists. We obtained support for these radical alterations from English Heritage and the City Planning Department, however legal concerns were raised about the blurring of boundaries, and the church was concerned about the establishment of public rights of way across its land. After months of negotiations, the scheme was abandoned, and we were asked to start again with a scheme that maintained fences and lockable gates to distinguish between Church and City land. The idea of the new West entrance was maintained in the built scheme and the completed gardens won a City Planning award.